The making of the 1986 Transformers Movie - hosted by Paul Hitchens (fan and collector of the Movie, and owner of the Spacebridge website). I attended both sessions of this panel, which had some different things in each, so everything is all combined into this page. If it is from this Panel, I think Paul Hitchens was the one in white. They started off by showing a Movie trailer, and some character drawings & bios. The design process for the Matrix was shown. The Matrix design was decided late, and as such it looked different in the Comic adaptation (the comic was based on an earlier version). - Autobot City was named Fortress Maximus, which ended up in the Comic Adaptation, but in the finished movie it didn't have a name at all. - Blaster's cassettes were originally going to be - Cubbie (lion), Stripes (tiger), Stinger (scorpion), and Bolts (biped). - Ultra Magnus death scene on Junk - as seen in the Comic, he was written to be quartered by the Sweeps, but was changed to be less gruesome on screen (the on-screen movie still has sound effects and events just before and after that suggest the scene was redrawn very late). - Prime Verse Dirge during Autobot City battle - when Optimus arrives and starts charging down the Decepticons and then transforms to shoot at them, Dirge jumps him and Optimus smashes him... leading onto his confrontation with Megatron. - Red Alert shot during Autobot City battle - after Optimus arrives, Ultra Magnus drives in with Red Alert, Sideswipe & Tracks on his trailer. They all transform and fire their missiles at Devastator, breaking him up into the individual Constructicons... who then fire back as six Decepticons, outgunning the Autobots. As the Autobots retreat, Red Alert is shot (and assumed dead). - Bonecrusher at Starscream's corronation has a line "he didn't", which comes after Rumble says "what'd he say his name was?" when Galvatron destroys Starscream. The Credits - three characters were listed in the closing credits but didn't have any lines or appear in the finished cut of the Movie... so, where were they in the script? - Dirge had a line while inside Astrotrain. Apparently the music score by Vince DiCola was done early enough for the some scenes to be storyboarded (between script and the actual animating), including the Fishing and return to the City scene, and the Autobot City Battle scene. Some test footage from the Takara promo trailer was shown (drawn very early, with some of it not being used in the final version of the movie), of a more powerful/armed Autobot City, as well as a Diaclone coloured Ultra Magnus (dark blue/red/black instead of light blue/red/white). The opening scene of Unicron eating Lithone was longer, and when Unicron transforms at the end of the movie, the Matrix was missing on Galvatron (because it's design was yet to be finalised). Snarl was in the test footage (along with a blue Swoop) but was then left out during the animation phase because they lost the character guide-sheets to know how to draw it. (I guess either the guide-sheet showed up during the animation phase, or some of the animators were familar with the Dinobots from drawing the regular cartoon to know how to draw him in, because Snarl does appear in a couple of scenes - animated shows and movies are drawn by many people, so different people would have drawn characters for different scenes and it is up to the editor or director to catch the errors). A photo of Robert Stack (at the premiere party?). 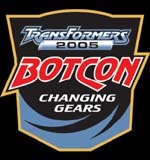 For the proposed Unicron toy (that never happened), it would have had 10 lines from the Movie as its electronic gimmick. Storyboards to the final climax were shown to the audio of that part of the movie. Some movie posters were shown (including ones from other countries), as well as some character art and other storyboards from the movie. As an incentive for theatres to promote the Transformers Movie, there were prizes for the best theatre display (I think it was noted that it was $5000). A postcard giveaway at theatres was proposed, but didn't end up happening. Some example shots were shown from one of the scenes with a Shuttle (I only wrote down "the shuttle scene", which isn't much help), to show the difference between the original storyboard, the original full-frame at theatres, and the trimmed down version seen on TV. The next panel of the day was the last, and was a repeat of the Rarities panel, which was covered on Friday at 10am. Jump ahead to the Awards Dinner.